Research Associate Ved Naithani prepares the bench-scale oxygen delignification unit at NC State for a sample run. 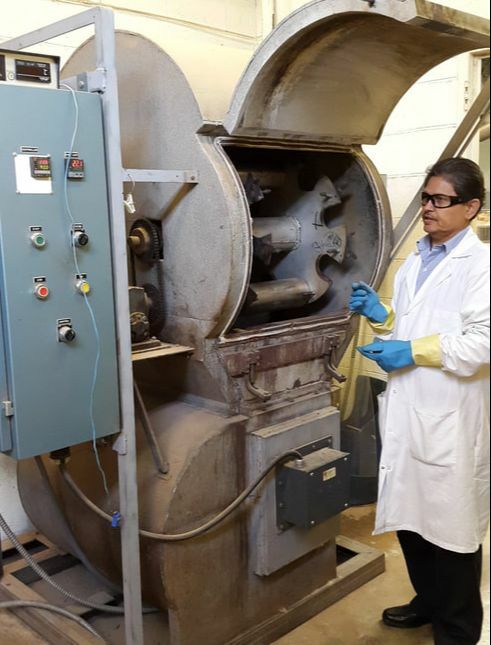 Professor Adriaan van Heiningen and student Ravi Patel of the University of Maine preparing pulp samples for a Next-Gen team project. Faculty members receive relevant requests for proposals. Partnership helps us maintain awareness of expertise and interests. Participants can serve as conduits for our activities to other faculty members who might benefit from or contribute to them. Our university partners find that APPTI is a good forum for understanding industry’s R&D needs. We hold our meetings at partner universities, bringing faculty into contact with our member companies and introducing our industry partners to university capabilities. We connect faculty with industry technology leaders, national laboratories, and Federal agencies. There is no fee for university partnership with APPTI and participation by faculty members is unlimited. APPTI promotes the development of advanced manufacturing technologies that promise transformational impact on the paper and forest-based industries. We are a 501(c)(3) tax-exempt non-profit alliance for scientific and educational purposes. Our structure positions us to compete effectively for Federal, State, and other funding opportunities. We can serve as the umbrella organization for consortium projects. We have been raising private funding from companies for seed-grant research; our university partners help us “ask the right questions, and ask them right”—and have early awareness of upcoming opportunities and requests for proposals. University team members can assist in project formation, selection, and guidance as appropriate. Since the founding in 1994 of Agenda 2020—renamed APPTI in 2017—universities have been a key part of the tripartite forum made up of companies, government agencies, and universities. This continues today. APPTI counts 11 university partners and welcomes additional ones. Interested? Please contact executive director David Turpin at David.Turpin@appti.org or 202 463 2742.